At-home teeth whitening products are very popular, and many people use them. Are they safe for pregnant women? We advise you to wait until after pregnancy to whiten your teeth. Most whitening products contain hydrogen peroxide, which can be swallowed during the whitening process. We don’t have enough information about how hydrogen peroxide and other whitening agents can affect a growing baby. The substances used in tooth whiteners may also increase irritation if your gums are sensitive. When you’re doing housekeeping chores, avoid oven cleaners and aerosol sprays. Be careful with chlorine bleach and ammonia; use safer products, such as vinegar and dishwashing soap, to clean your house. Wear rubber gloves to protect your skin. Be careful when you do yardwork, especially if you like to work in the garden. Sit on something that provides some support. Always wear gardening gloves; rubber gloves under your gardening gloves is a great idea. If you have regular manicures and/or pedicures, choose a salon with ventilation hoods that remove contaminated air from the area. The thyroid gland produces hormones to regulate metabolism and control functions in many of your body’s organs. About 2% of all pregnant women have a thyroid disorder. In fact, even if you don’t have a thyroid problem before pregnancy, if there is a chance you could have a problem, it may appear during pregnancy. If you have a history of thyroid problems, if you’re now taking medication or if you’ve taken medication in the past, tell your healthcare provider. Discuss treatment during pregnancy. Left untreated, thyroid disorders can be harmful to you and baby. Research shows women with a history of miscarriage or premature delivery, or those who have problems near delivery, may have problems with their thyroid-hormone levels. You can go to parties while you’re pregnant and still have a good time. A couple of things to remember—eat something before you go and practice portion control. Thyroid hormone is made in the thyroid gland; this hormone affects your entire body and is important in metabolism. Levels may be high or low. Low levels of thyroid cause a condition called hypothyroidism; high levels cause hyperthyroidism. Hypothyroidism is common during pregnancy. Symptoms include unusual weight gain and fatigue (both of which can be hard to determine during pregnancy), a hoarse voice, dry skin, dry hair and a slow pulse. If you have these symptoms, tell your healthcare provider. Hypothyroidism can affect your baby’s health if you’re not treated. Your baby may not receive adequate nutrition from you. Even with treatment, a baby is at risk of being born with abnormal thyroid levels. Many weigh less than babies born to mothers who didn’t have hypothyroidism. Flavors from foods eaten by a mom-to-be pass into amniotic fluid, which may promote flavor preferences before birth. By this time, baby can distinguish between sour, bitter and sweet. We know even unborn babies have a natural preference for sweet. Symptoms and Treatment. Symptoms of thyroid disease may be masked by pregnancy. Or you may notice changes during pregnancy that cause your healthcare provider to suspect the thyroid is not functioning properly. These changes could include an enlarged thyroid, changes in your pulse, redness of the palms and warm, moist palms. Because thyroid-hormone levels can change during pregnancy because of pregnancy, your healthcare provider must be careful interpreting lab results about this hormone while you’re pregnant. The thyroid is tested primarily by blood tests (a thyroid panel), which measure the amount of thyroid hormone produced. The tests also measure thyroid-stimulating hormone (TSH). An X-ray study of the thyroid (radioactive iodine scan) should not be done during pregnancy. With hypothyroidism, thyroid replacement (thyroxin) is prescribed. It is believed to be safe during pregnancy. Your healthcare provider may check the level during pregnancy with a blood test to make sure you’re receiving enough of the hormone. If you have hyperthyroidism, treatment is the medication propylthiouracil. It passes through the placenta to the baby, so ask your healthcare provider to prescribe the lowest possible amount to reduce risk to your baby. Blood testing during pregnancy is necessary to monitor the amount of medication needed. After delivery, it’s important to test the baby and to watch for signs of thyroid problems. Iodide is another medication used for hyperthyroidism, but it shouldn’t be used during pregnancy. It can harm a developing baby. Pregnant women with hyperthyroidism should not be treated with radioactive iodine either. Velocardiofacial syndrome (VCFS) is a genetic condition that may be hereditary. It is known by many names, including Shprintzen syndrome, craniofacial syndrome and conotruncal anomaly face syndrome. VCFS is one of the most common syndromes in humans, second only to Down syndrome in frequency. The term velocardiofacial derives from three Latin words: “velum” meaning palate, “cardia” meaning heart and “facies,” having to do with the face. It is characterized by various medical problems. The immune system, endocrine system and neurological system may be involved. Symptoms do not all occur 100% of the time. Most people with VCFS exhibit a small number of problems; many problems are relatively minor. The exact cause of velocardiofacial syndrome is unknown; however investigators have identified a chromosomal defect in people with VCFS. Most children who have been diagnosed with this syndrome are missing a small part of chromosome 22. If you have acid reflux, stay away from foods that could add to the problem. Some to avoid include acid foods, such as tomatoes and citrus fruit, and spicy and fried foods. Only one parent must have the chromosomal change to pass it along to a child. A parent with velocardiofacial syndrome has a 50/50 chance of having a child with it. However, it’s estimated VCFS is inherited in only 10 to 15% of cases. Most of the time neither parent has the syndrome nor carries the defective gene. The occurrence of congenital heart disease is most often the leading factor in diagnosis. Diagnosis is most frequently made using a genetic test called a FISH analysis (fluorescent in situ hybridization), which is almost 100% accurate. If the test shows chromosome 22 is not complete, the person has VCFS. If the test fails to show the deletion, the person does not have VCFS. Familial Mediterranean Fever (FMF) occurs most often in Sephardi Jews, Armenians, Arabs and Turks. As many as one in 200 people in these populations have the disease; 20% are carriers. However, cases have occurred in other groups, particularly Ashkenazi Jews. About 50% have no family history of the disorder. FMF is inherited and usually characterized by recurrent episodes of fever and inflammation of the abdominal membrane (peritonitis). Less frequently, pleuritis, arthritis, skin lesions and pericarditis can occur. If you want to avoid using medication, try a folk remedy. If you experience leg cramps, mix together 2 teaspoons of apple-cider vinegar and 1 teaspoon of honey in a glass of warm water, and drink it before bed. Onset of the disease usually occurs between the ages of 5 and 15 but may also occur during infancy or much later. Attacks have no regular pattern of recurrence and usually last 24 to 72 hours; some last for as long as a week. High fever (as high as 104F; 40C) is usually accompanied by pain. Abdominal pain occurs in nearly all sufferers and can vary in severity with each attack. Other symptoms include joint pain and a rash on the lower leg. Most people recover quickly and are OK until the next attack. Narcotics are sometimes needed for pain relief. Currently, no diagnostic test for FMF is available. The problem is diagnosed more on the basis of repeated episodes. However, researchers have identified the gene for FMF and found several different gene mutations that can cause the disease. The gene is found on chromosome 16. A protein assists in keeping inflammation under control by turning off the immune response. Without this function, an attack of FMF occurs. Researchers continue to work to develop a blood test to diagnose FMF. With more research, it may also become easier to recognize environmental triggers that lead to attacks, which may lead to new treatments for FMF. If a woman experiences a serious problem, she and her partner will probably want to know as much about it as possible. If a woman has a friend or knows someone who has problems during pregnancy, reading about it might relieve her fears. We also hope our discussions can help you start a dialogue with your doctor, if you have questions. Nearly all pregnancies are uneventful, and serious situations don’t arise. However, please know we have tried to cover as many aspects of pregnancy as we possibly can so you’ll have all the information at hand that you might need and want. Knowledge is power, so having various facts available can help you feel more in control of your own pregnancy. We hope reading information helps you relax and have a great pregnancy experience. If you find serious discussions frighten you, don’t read them! Or if the information doesn’t apply to your pregnancy, just skip over it. But realize information is there if you want to know more about a particular situation. Sit tall at the edge of a straight-backed side chair. 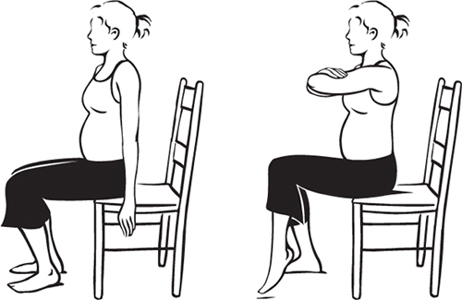 Fold your arms in front of you, at shoulder height, and slowly lean forward a bit. In this position, lift your left foot off the floor, and hold for 5 seconds; be sure you are sitting erect. Lower your left leg. Do 5 times for each leg. Stretches and strengthens abdominal muscles, thigh muscles and lower-back muscles.